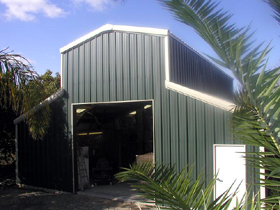 CLICK HERE TO SEE MORE METAL BUILDINGS… INQUIRE ABOUT A PERSONAL GARAGE! 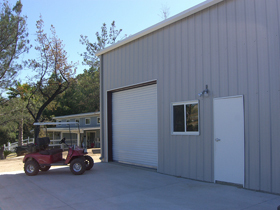 Customizable, cost-effective, and quick construction, steel garage buildings are one of Pascal Steel’s more popular choices amongst home and business owners alike. Don’t sacrifice quality for a price. Compared with traditional building methods and materials, pre-engineered steel buildings are unique in the building industry in that focusing on lower costs will actually get you a stronger building at a fraction of the time and expense. Traditional building projects involve a variety of metal building components from a diversity of suppliers constructed by multiple sub-contractors. It’s no wonder inefficiencies, miscommunications, and complications arise, extending project deadlines and increasing total costs. Pre-engineered buildings are in a sense “ready to go,” making the whole process seamless, quick, and under budget. The simple yet elegant process means less banging hammers and more time enjoying your new space. 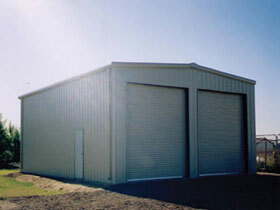 Custom made steel structures are inherently strong and resistant to the elements. Not only will a steel garage protect your valuables, cars, and equipment from high winds, heavy snowfall and extreme temperatures season to season, but will naturally deter mold and termites potentially saving thousands in costly maintenance and repairs. 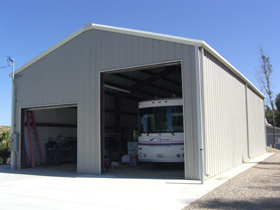 Detached steel garages are the quickest and easiest way to add square footage and increase the value of your estate. The amount in which property value increases depends entirely on the type of steel garage building and how it complements the home or business. For example, adding a detached two-car steel garage to a home without a garage will increases the market value of the home. But adding a large custom multi-purpose garage and workshop may increase the value of one’s estate, but limit the amount of potential buyers when trying to sell. However, most people like more storage and, in most cases, adding an additional steel garage storage space will directly increase the desirability and value of your home or business. Our in-house engineering team can help you design the perfect steel garage for your specific needs. 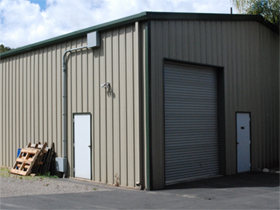 Whether you want a standard two-car garage, or a work space that can also be a boat or rv storage facility, steel garage buildings can be designed with versatility in mind. More than a steel shell, your steel garage space can come with customized doors, windows, rafters, and additional attic storage making it the perfect addition to your home or business. 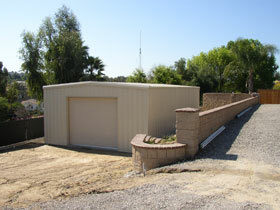 Detached steel garages can increase the curb appeal of your home and surrounding yard. Many limiting architectural issues come into play when adding an attached garage to an existing home: both structurally and aesthetically. Detached from the home, a steel building garage actually gives homeowners more options to complement their home than an attached garage. With a variety of design elements at their disposal, homeowners can choose to mix and match the building style and color as they please. Many wishing to expand their home’s living space have creatively turned to detached steel garage buildings. It is much easier to repurpose an existing attached garage into a game room, sports den, or guest room than it is to remodel. A detached steel garage is an excellent cost-effective solution to turn an existing garage into increased living space without giving up valuable storage. We’d love to discuss your specific needs further. Contact us at Pascal Steel.